Sukhinder Singh Cassidy is Founder & Chairman of JOYUS, the web’s first and award-winning premium video network dedicated to shopping. 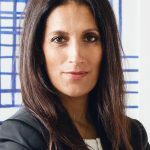 Sukhinder has been a leading consumer internet and media executive with over 18 years of leadership experience at global and early stage companies. In 2015, Sukhinder founded a new social enterprise initiative, theBoardlist, a premium talent marketplace aimed at connecting highly endorsed women leaders with board opportunities in the tech industry. Supported by a community of over 900 leading CEOS, senior executives and venture capital firms, to date over 1400 senior women leaders have been nominated by their peers via theBoardlist to serve on boards in the US, Europe and Canada. Even though the percentage of women in the talent pipeline has steadily increased over the last 3 decades, there are still large gender gaps from entry-level right through to top-executive positions. In tech, women hold only 30% of the entry-level roles and only approximately 7% of private tech company boards are made up of women. Here are 5 reasons why having women in leadership roles benefits your entire company. Time and time again, researchers find that diversity of thought leads to better problem solving — when we collaborate with people of different genders, ethnicities and race in our workplace, we all do better work. More American workers perceive female executives as being honest and ethical than they do male executives. 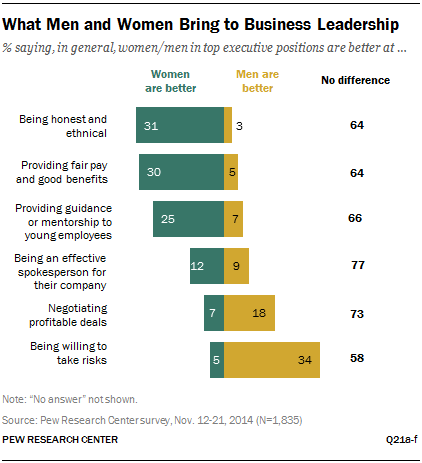 Pew’s “Women and Leadership” surveyed Americans in 2015 and found that 34% say women are better at this, while only 3% say men are better at it (64% say there’s no difference). While it’s unclear whether this means women are actually more honest, it’s a good reminder of how morally gray some business decisions can be. Leaders are often tasked with choosing between options that aren’t black and white, ethically speaking, and the capacity to lead honestly is important to the entire company’s success and job satisfaction. Last year, researchers found that women are better at making deals in the Senate than their male peers — collaborating and working across party lines in greater numbers than the men. “Over the past seven years, the Quorumanalysis found, the average female senator co-sponsored 6.29 bills with another Senate woman, while the average male senator co-sponsored 4.07 bills with another Senate man” and that “the average female senator co-sponsored 171.08 bills with a member of the opposite party; for the average male senator, that figure was 129.87.” What can work in the Senate can work in the boardroom. While studies have shown women have a more difficult time finding mentors than men, 30% of those surveyed by Pew Research felt women made better mentors than men — while only 5% felt men were better mentors than women. Mentorship and sponsorship can be incredibly important for career growth and job satisfaction, so having increased supply “on the bench” in your company can give your employees an edge. “There is nothing like a great mentor — someone who can guide you and provide honest, real-time, practical advice,” says Jackie Stone, CMO of MiMedia. “Mentors don’t judge your thoughts, ideas or dreams — they help you achieve them. My mentors have guided me to new opportunities and pushed me to take risks.” Want to be a better mentor? Open Forum has tips. According to a Pew Research Center survey, today’s young women in the United States are starting their careers better educated than their male counterparts. A more educated workforce is essential for implementing innovative techniques, challenging the status quo and introducing new business approaches. Women should be given equal chances to ignite the growth of a company. If these 5 reasons aren’t enough, think about this. A 2016 survey of 21,980 publicly traded companies in 91 countries concluded that “the presence of more female leaders in top positions of corporate management correlates with increased profitability of these companies” (source). This confirms what study after study for more than a decade have found — that having increased female leadership on your team or board leads to increased financial results. If that doesn’t convince you, what will?